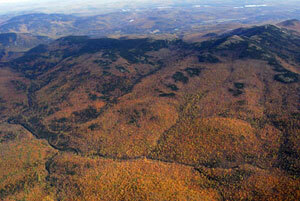 The United States Congress designated the Wild River Wilderness (map) in 2006 and it now has a total of 24,032 acres. All of this wilderness is located in New Hampshire and is managed by the Forest Service. The Wild River Wilderness was designated in December 2006 with the passage of the New England Wilderness Act and is now the newest Wilderness unit on the White Mountain National Forest. Approximately 23,700 acres are designated as Wilderness, all of which are managed by the US Forest Service. The majority of this acreage is in the unincorporated township known as Bean's Purchase located in the northeast corner of New Hampshire, quite close to the Maine state line. The Wild River Valley is an outstanding example of the resiliency displayed by forests of the northeastern United States. At the turn of the nineteenth century the area was covered in pristine forest with only a few inhabitants in the lower reaches of the watershed. One hundred years later the valley stood in stark contrast after being penetrated and developed by large-scale logging operations. A rail line followed the banks of the Wild River from its confluence with the Androscoggin River almost all of the way to its headwaters at Perkins Notch. Numerous logging camps were located in what is now the Wild River Wilderness and a booming village named Hastings had sprung up along the river's lower reaches. Any timber that was moderately accessible had been removed by the beginning of the twentieth century despite repeated attempts by the river to live up to its name and erase all timber-related infrastructure. Dams, bridges and railroad tracks seemed to fall prey to the river's raging storm flows on a regular basis but were always rebuilt to meet the country's growing demand for wood. In 1903 the era of logging camps and railroads came to a quick end in the upper sections of Wild River. Careless campers had left a fire unattended near the river's headwaters at No Ketchum Pond while they fished for brook trout. Fueled by a severe drought and ample dry logging slash, the fire quickly spread up both sides of the valley and consumed most of the remaining timber that had yet to be harvested. When the spring rains eventually put the fire out little evidence remained of the logging operations or any previous human presence. Though denuded and charred, the area had once again proven itself true to its name. In March of 1914 the US Forest Service purchased 41,000 acres from the Hastings Lumber Company thus beginning public ownership of the area. Management approaches to the area prior to Wilderness designation included sustainable forestry and use as a state game refuge. Today the Wild River Valley attracts visitors who want to explore an area where the forest has largely reclaimed the evidence of a short but colorful human occupation. Historical artifacts may still be found scattered around the woods but with each season these signs of civilization fade further into the natural setting. The Wild River Trail serves as the main travelway for area visitors and follows an old railroad grade along the river to its source at No Ketchum Pond. From this trunkline a number of hiking trails branch off to climb the adjacent steep mountain slopes, many following old spur lines from the railroad. Along the ridgeline to the west, the Appalachian National Scenic Trail skirts the Wilderness boundary as it climbs over the summits of the Carter-Moriah Range. From these summits one can look east across the valley to the opposite ridgeline forming the watershed and Wilderness boundary. These mountains may not reach the heights of the Carter-Moriah Range but peaks such as North Baldface catch one's attention and are recognizable from a great distance. The fire of 1903 burned nearly all of the vegetation from Baldface's thin soils and left the granite beacon that marks the Wilderness' southeast boundary. The Wild River Campground is located at the end of a 5 ½ mile dirt road and provides the main access point to the Wilderness except for during the winter when the road is closed. This small rustic campground is situated in the mixed forest type common to the area's lower elevations where maples and oaks mix with hemlocks and pines. The lowest elevation point in the Wilderness (~1100 feet) can be found by crossing the river just downstream of the campground. Wildlife is diverse in the forest and includes such charismatic megafauna as moose, black bear and whitetail deer. As one climbs in elevation the hardwoods slowly disappear including the NH state tree, the white birch, which recolonized much of the area after the fire of 1903. Spruce and fir dominate the upper reaches of the watershed before giving way to the short and dense subalpine vegetation that reaches close to the Wilderness highpoint on Carter Dome (~4800 feet). Although the larger mammals do occasionally inhabit the forest up high, visitors are more likely to see birds and smaller mammals such as pine marten, red squirrels and snowshoe hare. The Wild River Wilderness is a multi-faceted area that appeals to diverse interests. Whether you're interested in hiking, fishing, hunting, climbing or exploring the woods in search of clues to the area's history, the Wild River Valley is sure not to disappoint. Please remember to tread lightly and leave all cultural and historical artifacts as you found them. If you don't you just might have to deal with the ghosts of the log-drivers or the sleepy vengeance of the Wild River! Planning to Visit the Wild River Wilderness? How to follow the seven standard Leave No Trace principles differs in different parts of the country (desert vs. Rocky Mountains). Click on any of the principles listed below to learn more about how they apply in the Wild River Wilderness.